1996 was in many ways a simpler time. Apple pies were 10% more delicious, our country wasn't bogged down with idiotic political bickering, and basketball players were routinely given lead roles in major motion pictures. Not only did 1996 give us the incomparable Space Jam , it combined that with Kazaam , a gritty re-telling of Aladdin featuring a rapping genie and promising "slam dunk fun." Even the font is slam-dunk fun! It all starts when Max (Francis Capra [Veronica Mars' Weevil Navarro]) runs into some trouble with bullies after they believe his lie that a supply closet key opens a safety deposit box full of Rolexes. Do you really get to be mad when you believe something that stupid? Poor Max has even more trouble at home where his mom (Ally Walker) is finalizing her divorce to his father to marry a bland fireman. He runs out of the apartment shouting "what about ME?" like a petulant six year old. After he finishes storming off, Max runs into the bullies and they engage in a chase that ends up at the abandoned lamp store. Yes, the lamp store. Max falls through a hole in the floor about five stories onto a pile of lumber, but is not only completely unscathed, the bullies are still after him. 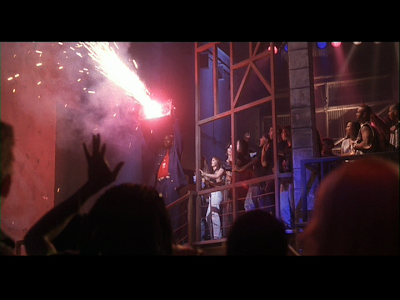 Just when all hope seems lost, he accidentally turns on a magic boombox that had been lost in the wreckage. Yes, a magic boombox. Shaquille O'Neal, I mean Kazaam, emerges and scares off the bullies with his slam poetry (no pun intended, I swear), but despite all his rhymes finding creative ways of saying he is a genie, Max doesn't believe him. Completely ignoring his new-found genie, Max proceeds to track down his father the following day. This leads him to a nightclub where his father is apparently a music producer. His dad doesn't recognize him and makes fun of Max, causing him to storm off like a little baby. Kazaam finds Max at a ridiculously cool rooftop that Max has converted into his own personal BMX track. 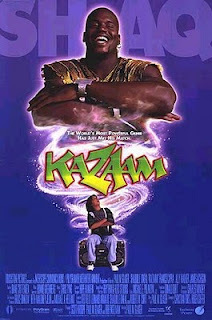 Rather than talk out his daddy issues or ponder his three wishes, Max chooses to engage Kazaam in a bicycle race. A lot of the "jokes" in this movie involve Shaquille O'Neal being really tall, so he's racing on a child's bike and at one point just gets off the bike and carries it. Kazaam is on the verge of crashing when his bike magically grows into a flying motorcycle, and Kazaam goes back to freestyling about how he is a genie. Finally believing that this seven foot tall black man who pops up everywhere and came out of a magic boombox is a genie, Max wishes for a bunch of junk food. The clouds part and it starts raining hamburgers, tacos, french fries and candy, the latter coming in its original packaging for advertising purposes. Are hamburgers and tacos really "junk food?" 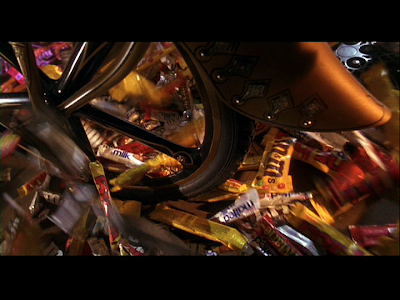 Roger Ebert singled out this scene in his 1.5 star review, questioning how a 5,000 year old genie knew to give Max modern candy in its original packaging. Because the film is so accurate otherwise. Magic genies I can believe, but candy in PACKAGES? Come on! With his genie in tow, Max goes back to the club and meets his dad, finally explaining who he is. We find out the reason Max's dad is such a deadbeat: he's selling pirated copies of live performances! Dun dun duuuuuun! Piracy of the entertainment industry is the worst thing a person could ever do! Max and Kazaam watch part of a musical performance, some sort of TLC type knock-off, when Kazaam is singled out by one of the singers and handed a microphone. Predictably he starts rapping about being a genie again. The evil mustached owner of the club, Malik (Marshall Manesh), being from IRAN, recognizes a genie when he sees one. He manages to get Kazaam into a limo and feeds him "goat eyes" or something equally obscure and disgusting, calling it "food of genies," to which Kazaam responds that he hasn't had any in 3,000... days. 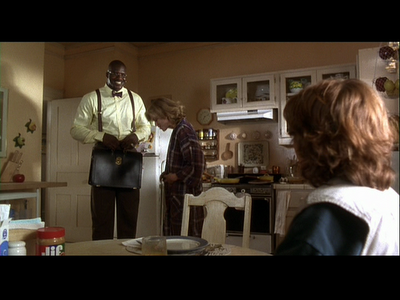 Way to keep a low profile, Kazaam. I mean besides calling yourself a genie in every line of every rap. His magic is pretty awe-inspiring! 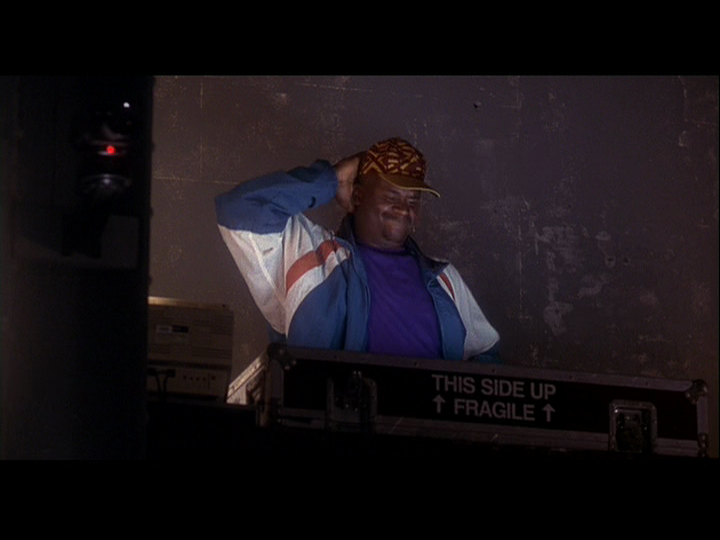 And yes, that is his magic boombox. What follows is eminently predictable, and involves Max trying to help his dad, Kazaam rapping about being a genie even more, then using Shaq Fu to fight some guys, then becoming free, etc. You know the drill by now, right? The movie is generally awful. As a musical revue, it was hopelessly dated when it was released. As a family film, it's about a bratty little punk who gets a giant African dude to do his bidding. As a movie for children it's got a number of references they're guaranteed to not get, especially since pirating live performances isn't the sort of villainy and child can understand. As the whiny protagonist, Francis Capra has a good deadpan delivery but he's not a very good lead. It's also baffling how Ally Walker and some Christian Slater look-alike managed to produce a kid who is clearly at least half Hispanic. If I were Max's dad I'd get a paternity test. As far as Shaq goes, he's actually not terrible, at least compared to his Space Jam rival; he has a number of funny lines and a few of his Bugs Bunny style dress-ups are pretty amusing. In one scene, he dresses as a giant nerd and acts as Max's tutor. As funny as the visual is, it immediately becomes head-scratching when Max's mother starts flirting with him. Isn't she engaged to be engaged to a bland fireman? And why would she be attracted to a seven foot tall man with rimmed glasses and a pocket protector? Of course the worst part about the whole exercise is Shaq rapping. We're talking about a guy who lacks the rhythm to shoot a free throw. What's worse, every single one of his raps are about how he is a genie. I guess that was supposed to be the "slam dunk fun" I was promised? "Hey, did you get a load of that NERD?!" I feel for Shaq, as I'm sure it's hard to get normal parts when you're seven feet tall and have a voice that needs to be electronically raised to human levels, but this is just shallow marketing run amok. We get shills for Pepsi, Starburst, M&Ms, etc., not to mention a potential jumping off point for Shaq's would-be rap career. Of course we've all seen how that turned out. I guess the upside for Shaq is that after giving up his musical dreams he won four NBA championships. "Slam Dunk Fun" in action. It's still worth watching, as a sort of time capsule for what people thought would sell to the mainstream in 1996. Max is textbook "90's attitude," from his private BMX park to his long hair to his whiny selfishness; the whole project captures the zeitgeist of the era. Is there any other decade where a major studio would spend millions of dollars on a project featuring a basketball player as a rapping genie who comes out of a magic boombox? I really hope not. 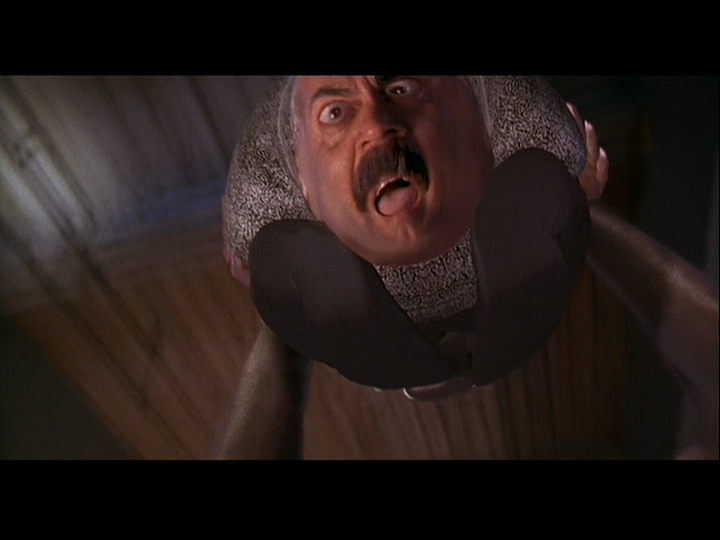 Kazaam: Who dare to wake me? Ain't gonna make this a mystery. Don't wanna do time on your wishes three. Watch it, boy! You don't want to diss me! Or I'll dish out my misery. Now. who's that sorry wanna-be that disturbed my Zs? If you wanna be number one, I'm sorry boy, that's been done! But if you got the itches for a sack of riches don't matter how avaricious, I'm the man that can grant your wishes! 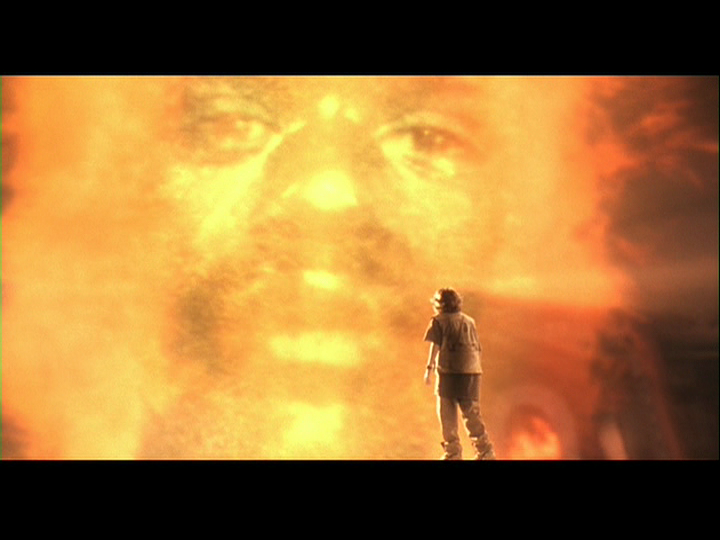 Kazaam: Goat eyes! I haven't had these in 3,000... days. Max Connor: So... tell me that wasn't a wish. Kazaam: Like the main man did with the loaves and the fish? Agreed. The kid was more skeptical of Shaq's magical powers, than Dawkins at the Vatican.